If there’s one thing that all owners eventually learn – hopefully before it’s too late – it’s that a dehydrated cat is a very big problem. While people get dehydrated after physical activity, for example, they recognize it and can quickly recover by drinking fluids. But a dehydrated cat can’t tell you when he’s dehydrated, has no control over whether there’s enough water available, and can quickly become seriously ill – even before you notice. Because cats originated as desert animals, they evolved to get most of their fluids from prey containing 70% water content, and since then have never really evolved to drink enough fluids separately from food. A cat can live for up to two weeks without food – but a cat without water can live only about three days. As it is for all living things, water is essential for bodily functions. Water flushes out toxins from the kidneys, so too little water can lead to kidney problems, and losing fluids also means the cat’s body is missing important electrolytes such as sodium, potassium, and chloride. In addition, diabetes and renal failure can cause excessive urination, which also can cause dehydration – and in a vicious circle, dehydration exacerbates diabetes and kidney disease. Although dehydration can stem from many external causes, it’s often a symptom of an underlying condition. What causes dehydration in cats? A dehydrated cat may also have developed the problem from too little fluid intake. There’s no set amount of water that our feline friends need, and each cat’s needs depend on his diet. Dry cat food contains only 10% water, while canned or pouched food contains around 80% water. A cat living on a diet of dry food will drink about a cup of water per day. A dehydrated cat is suffering from lack of fluids and electrolytes, and therefore is in danger of damage to circulation, digestion, and kidney function. The cat will feel sick and uninterested in drinking water, creating a vicious cycle that can ultimately lead to organ failure and death. And because dehydration is often the result of an underlying illness, it’s even more important to get appropriate treatment as soon as possible. What are the signs of a dehydrated cat? You can check for the last two with simple tests. To check skin elasticity, pull up some skin at the base of the neck and let it go. If it doesn’t spring back into its original state immediately, you have a dehydrated cat. To check for dry gums, press a finger against your cat’s gum. When you remove your finger, there will be a white spot where you’ve pressed the blood away from that area. It should only take about one or two seconds for the blood to return. If a cat is dehydrated for external reasons, such as being trapped in a room away from water, or becoming overheated in hot weather, you can start treatment yourself at home. Get the cat to a cool, dry spot with fresh, cool water. If the cat refuses to drink, you can encourage her by offering juice from canned tuna or salmon in her water. Meat-flavored water and electrolyte supplements are also an available option at some pet stores. Other options for treating a dehydrated cat include lactose-free milk or low-salt chicken broth. Some vets suggest giving Pedialyte. Also, pet water fountains are more appealing to some cats than bowls. If simple methods for rehydration at home aren’t enough, or your dehydrated cat can’t keep fluids down, you should get him to the vet as soon as possible. The vet can give anti-emetics to stop vomiting, and may also do blood tests or other tests to confirm dehydration and identify any underlying conditions that led to dehydration. The vet may give your cat fluids under the skin (subcutaneously), which will take a few minutes, or even hospitalize your cat and deliver fluids intravenously for one or two days. At this point it’s also sensible for the vet to start treatment for any underlying illnesses discovered. If your cat is dehydrated due to a chronic illness such as kidney disease, she may need to have fluids injected on an ongoing basis. 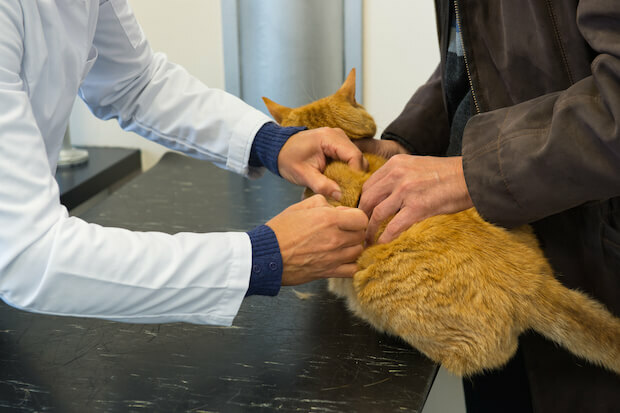 You can always take her to the vet for this, but many cat owners learn how to deliver subcutaneous fluid therapy at home. Cats have space between their skin and the underlying tissues, and when fluids are injected there, the cat's body absorbs and uses them over the next few hours. This practice can add quality, comfortable time to an elderly or sick cat’s life. The vet can teach you how to attach the fluid bags to an administration set, attach a needle to the plastic administration tube, choose the spot to administer the fluids and insert the needle. Obviously the best practice is to keep kitty fully hydrated at all times in the first place. It’s important for cats to have a clean bowl with fresh water at all times, preferably wide and shallow enough that he won’t have to get his whiskers wet. 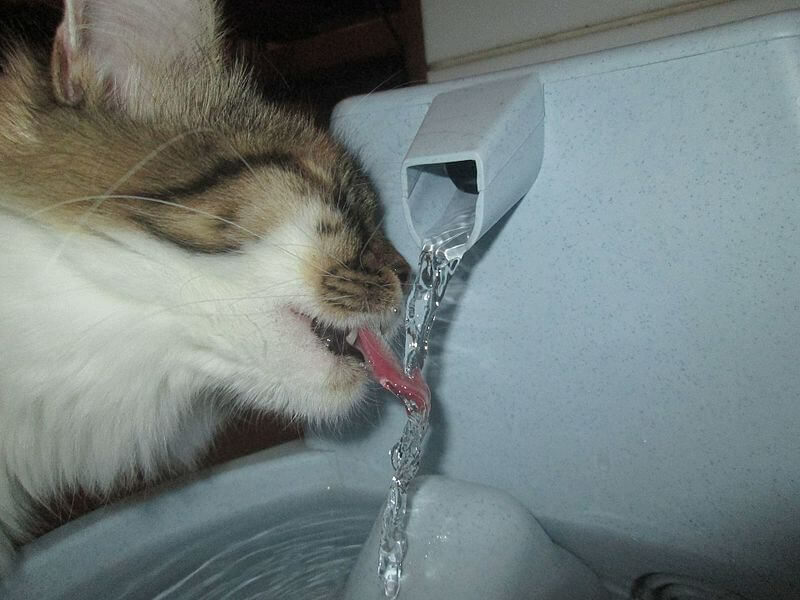 You may need to invest in a water fountain for a finicky cat, which has the advantage of satisfying multiple cats who probably dislike sharing a single bowl, but don’t mind when the water is fresh and flowing. Cats may also have a preference for stainless or ceramic water bowls – plastic can absorb odors that cats can smell even if you can’t, so it’s a good idea to skip the plastic for a fussy feline. And always place water bowls away from litter boxes and food dishes, as cats generally prefer their water that way. If necessary, experiment with tap water, filtered tap water and even distilled water for your cat, to find out if there’s a type he prefers. Make sure to provide fresh water several times a day, as cats prefer fresh to stagnant water. Taking these steps can keep a fussy kitty drinking healthily, and keeping an eye on signs of dehydration that might come from other sources is the other important thing an owner can do. 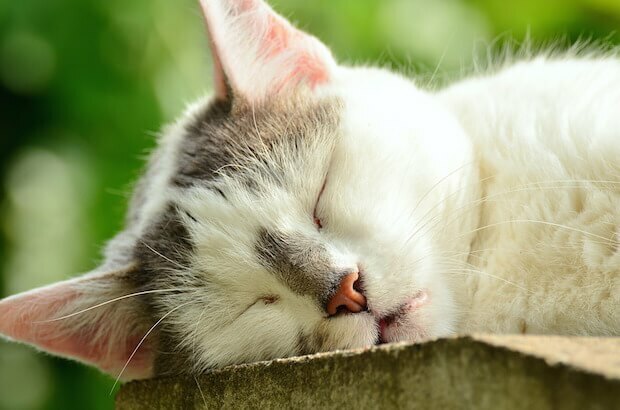 But if you have any questions about a dehydrated cat, or a cat suffering from any problem whatsoever, it can be a huge help to speak with a veterinary Expert on JustAnswer. These experts are available at any time, night or day, and there’s no need to stuff a sick cat into a carrier for a trip across town! Shes not eating or drinking anything for 2 days. Cinnamon.